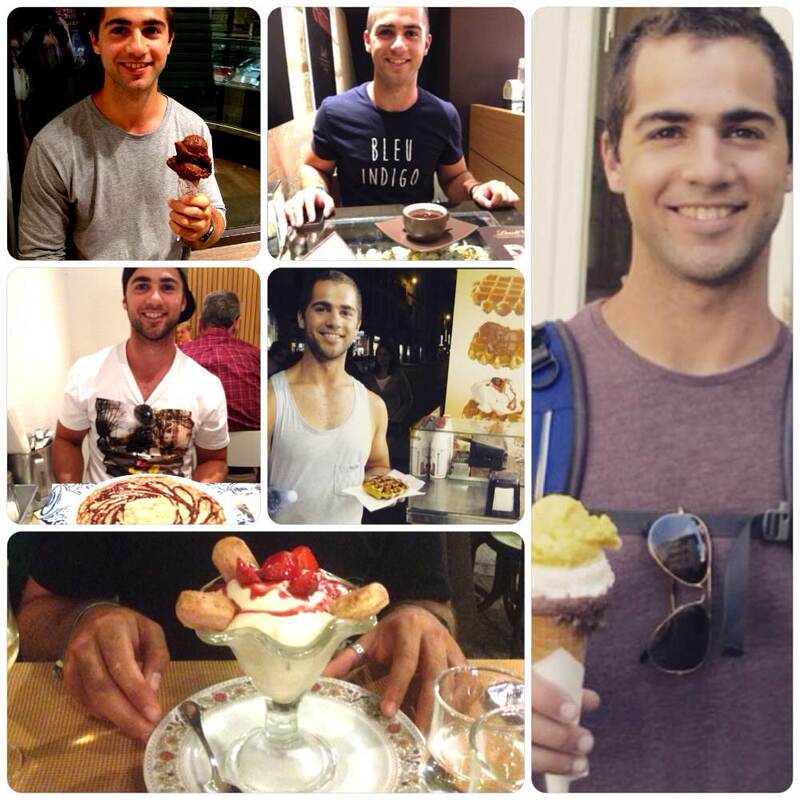 I hope you’ve all read my previous post filled with restaurant and dessert recommendations in Rome. Definitely worth a visit! 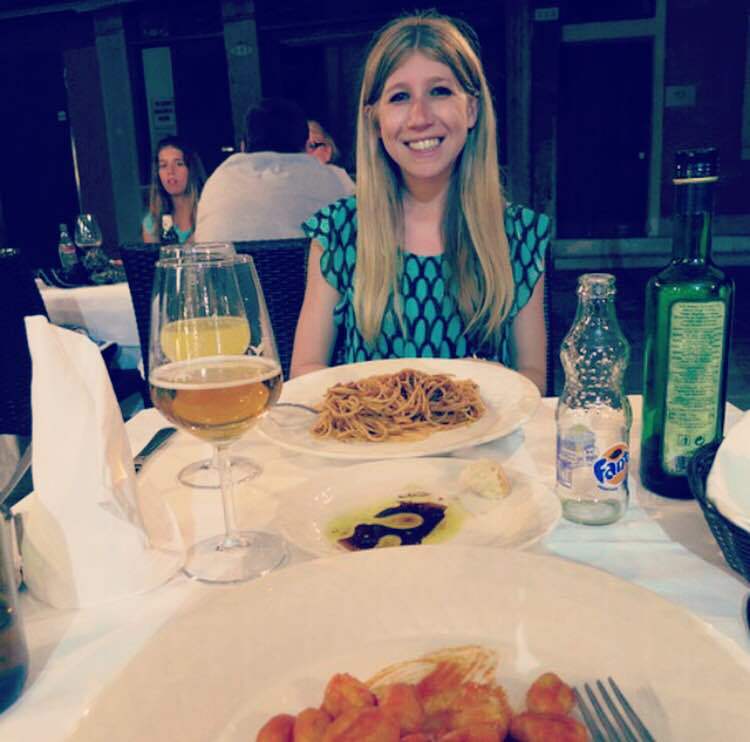 Luckily for me, eating in Rome (and Italy in general) is pretty easy and my dietary restrictions aren’t so restrictive. But I do have some tips – hopefully I can share some wisdom about a range of dietary requirements. I only had two real problems with nuts in Rome. The first, and really the most important problem, was my unfortunate, extremely dismal ability to part-take in (what many people would consider to be) the best part of every meal – dessert. This really isn’t a Rome problem – it’s more of a global problem. Dessert just isn’t really that considerate of nut Allergians. I’m used to this though, so this wasn’t such a big disappointment. 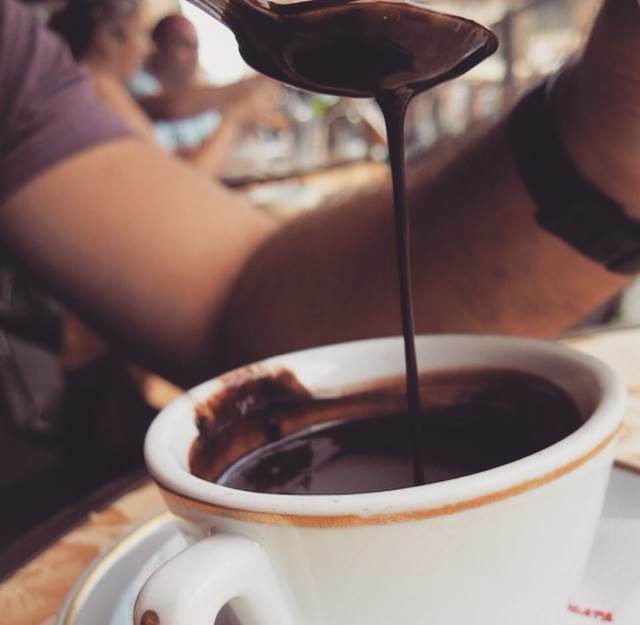 I did, however, get to enjoy a delicious crème brulee and some Lindt chocolate (see my post here), get to enjoy watching the BF try any and every delicious dessert imaginable (see my post here), and get to save on the calorie front. Really – it could be much worse. Secondly, I faced a problem at the Vatican Museum. This was surprising really. After all that cultural and historical explosion that is the Vatican Museum, my friends, the BF and I were ready for a good feed. 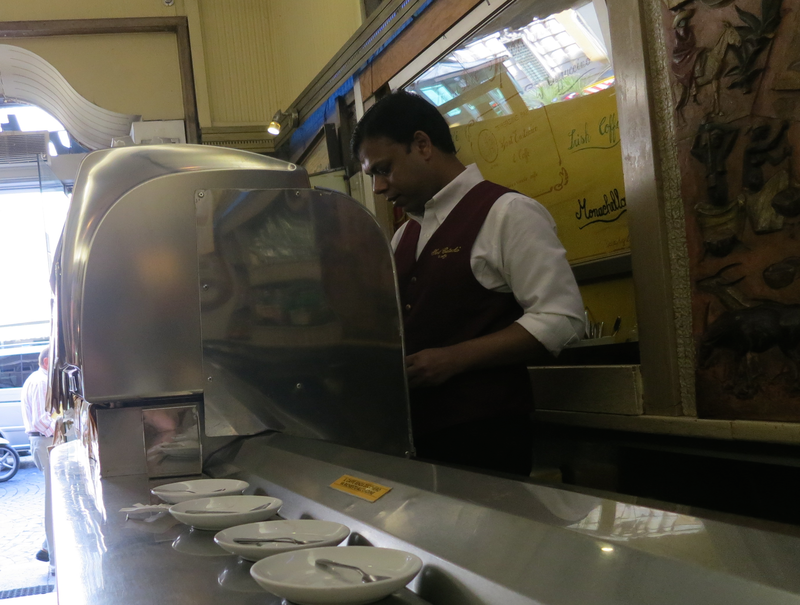 We went to the Vatican Museum food area, which kind of had a sort of canteen thang happening. It felt like a school cafeteria. Anyways, I asked the man behind the counter whether anything had nuts in it and, after checking, told me that I shouldn’t eat anything. I think there were lots of nuts used or something like that. While it is obviously pretty much impossible to find a kitchen that has zero nuts present, most places say something along the lines of ‘there may be traces present because our kitchen has nuts’. But when a place tells me not to eat their food, I will always listen. So that made things a little bit tricky, given we hadn’t finished the Museum. So I resorted to some packaged fruit salad and crisps, which seemed like the only safe options. 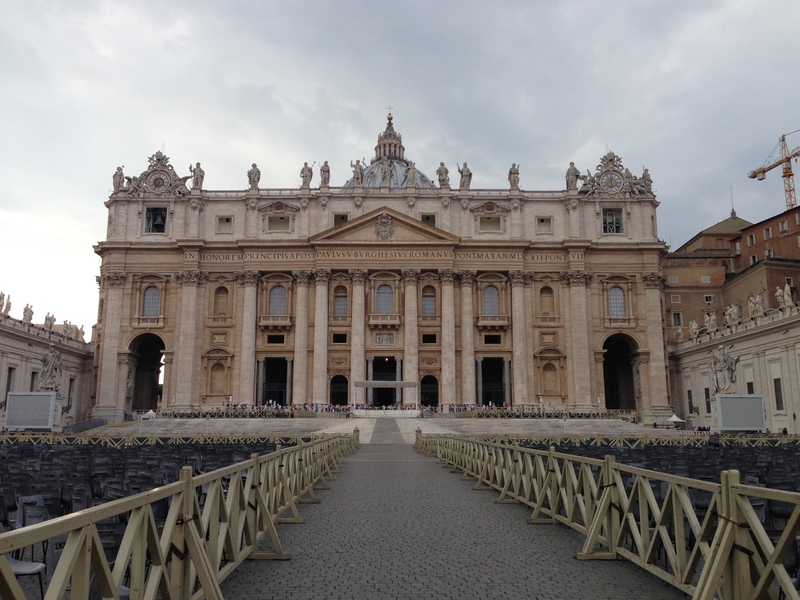 So just a warning to people with nut allergies going to the Vatican Museum – probably best to bring your own food. There also may have been a fancier restaurant somewhere in the museum – I’m not sure. In Australia, whenever I order pasta of some kind, I ask for no cheese. This is because in Australia, pasta almost always comes served with parmesan cheese on top. And once your pasta has cheese on it, there is no way of getting it off. The melting and the stringing and the dispersing.. believe me – I’ve tried many a time. But I quickly learnt in Italy that this whole cheese-on-top-of-the-pasta thing was an Australian (or international) invention, which did not originate in Italy. Sort of like the linguine thing (I didn’t find any linguine in Italy, so, again, this must be an international invention). So what would any ordinary person do… they would stop their silly request for “please no cheese on top”, because I had had enough funny looks from waiters [why is this extremely uncultured girl asking for no cheese on her pasta?]. But apparently the Italian status quo is a bit different in Rome. 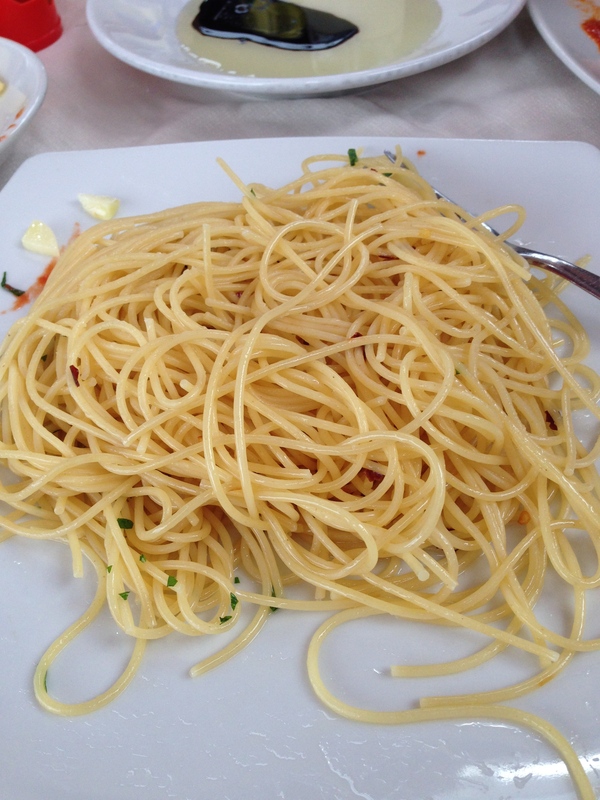 It was my second meal in Rome and I ordered pasta (with no cheese-less request). And what do you know – my pasta came out covered in cheese. It was quite unfortunate really. So I scraped it off as best I could (the melting… the stringing… the dispersing) and ate (what was left) around it. What’s the moral of the story? Don’t be too embarrassed / think you are silly for asking questions relating to any of your dietary requirements or allergies. A funny look from a waiter is much better than only being able to eat ¼ of your food or, worse, a reaction of sorts. My dietary restrictions only faced one real problem in Italy – pork. 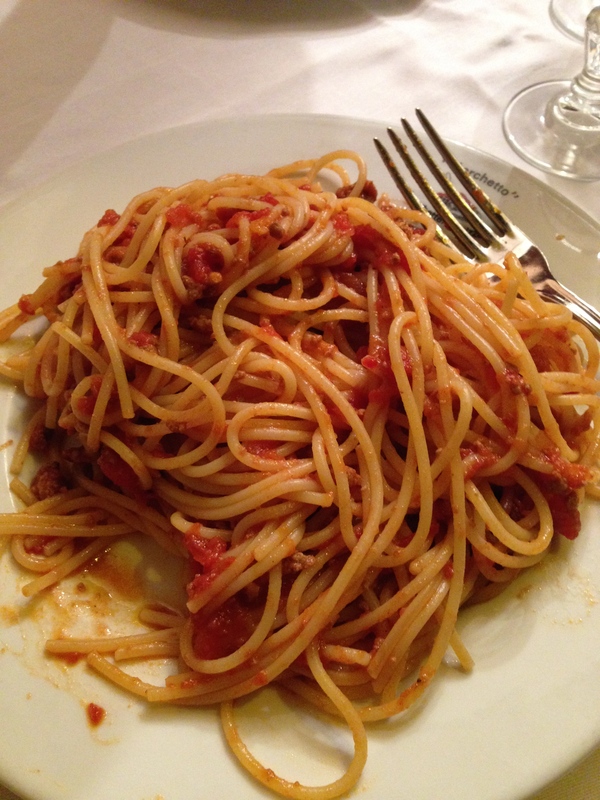 There is heaps of pork used in Italy (which I do not eat) and it often features in my fave spaghetti bolognese. This meant that I always checked what meat was used before I ordered something. I had one hilarious exchange with a restaurant hostess near the (under renovation) Trevi Fountain. She didn’t speak very good English. I asked her the standard question and she didn’t understand what I was saying. After a few attempts, I had to resort to basics. Keep it stupid simple, so they say. I pointed at the spaghetti bolognese on the menu, said “moo moo” or “oink oink” and, whilst lifting my shoulders, held my hands out in the typical inquisitive stance. It really was an all time low in language barriers. She responded with “moo moo” (laughing hysterically, of course) and I enjoyed my pork-free bolognese. 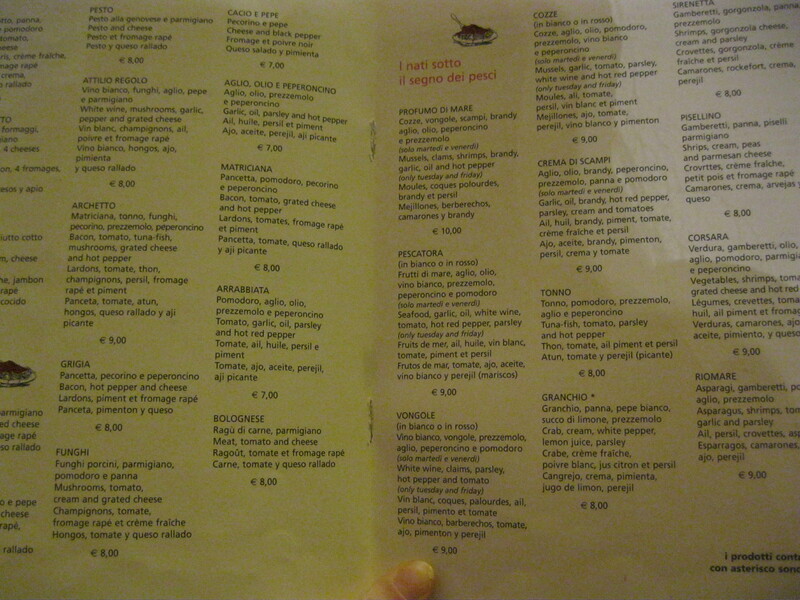 Finally, for those who are Kosher (which I am not), there are quite a few Kosher restaurants in the Roman ghetto. 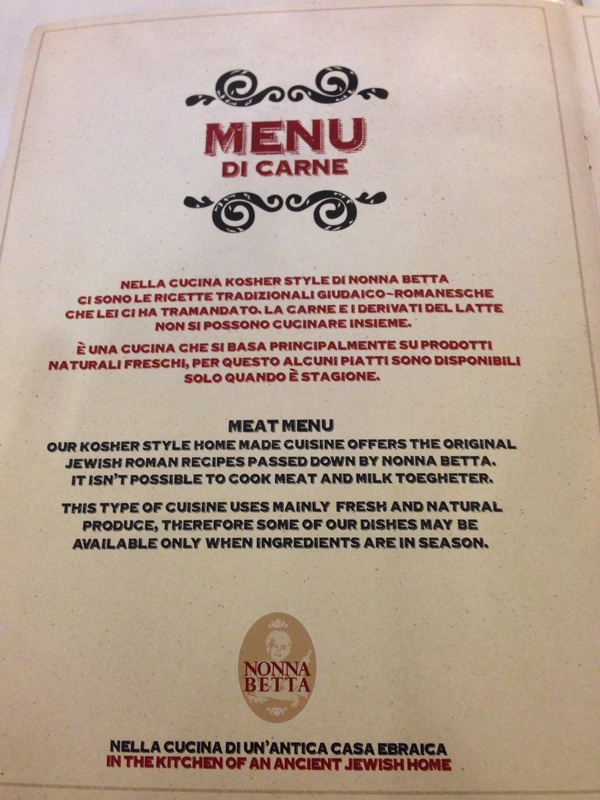 When I visited the area, I ate at Nonna Betta which is supposedly one of the best. I ordered tagliolini with ragu and “Grandma betta’s sauce” and it was delicious! 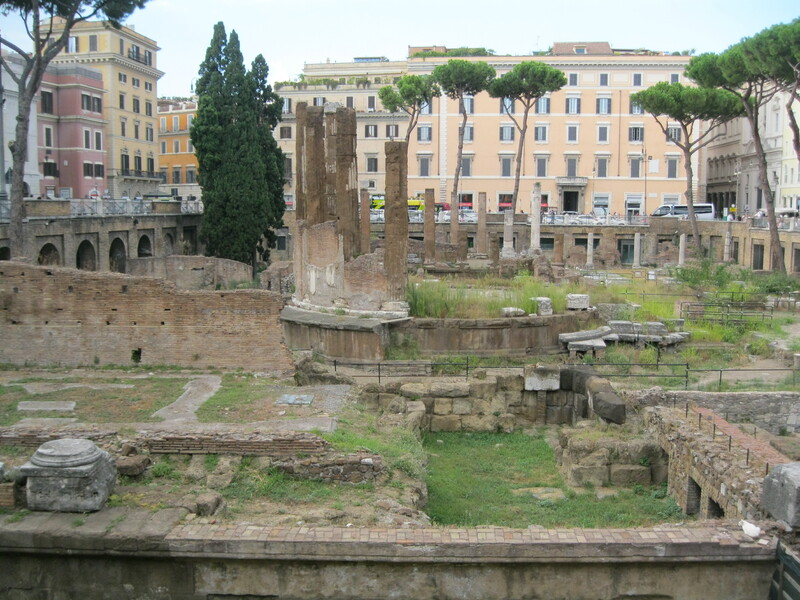 For a list of some other restaurants in the Roman ghetto, see here. 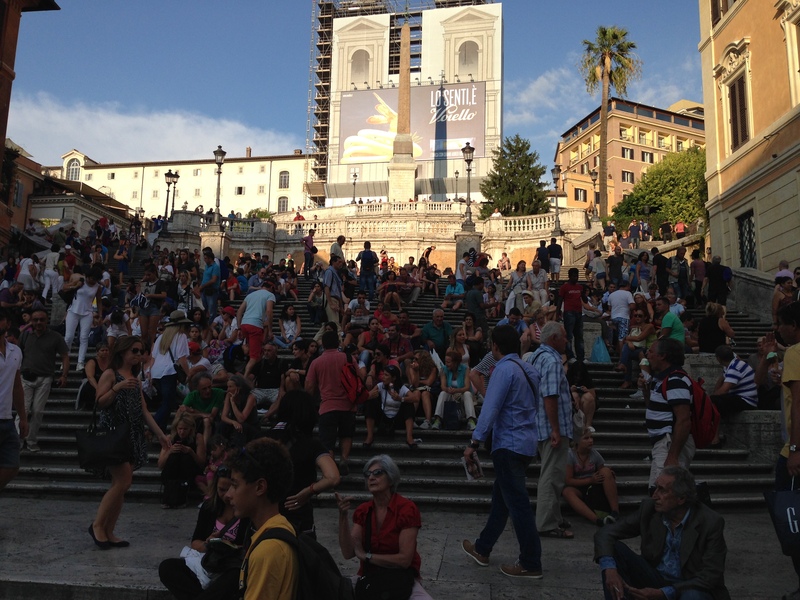 So it’s safe to say that there is something for everyone in Rome, and Italy in general. You’ll almost always be able to find something you can eat, which is a nice change for us Allergians (* cue the last resort search for a McDonalds, as occurs in some countries). And if you can’t – there’s always Queen’s Chips Amsterdam where you can get a massive serve of hot chips in a cone with one of a variety of sauces dripping all over it (see my previous excitement about this here). So that’s about all for Italy. Our next stop was the amazingly stunning Greek Islands! γιορτάζω! Putting aside the plethora of touring and sightseeing that Rome has to offer, it is also home to some delightful Italian food. 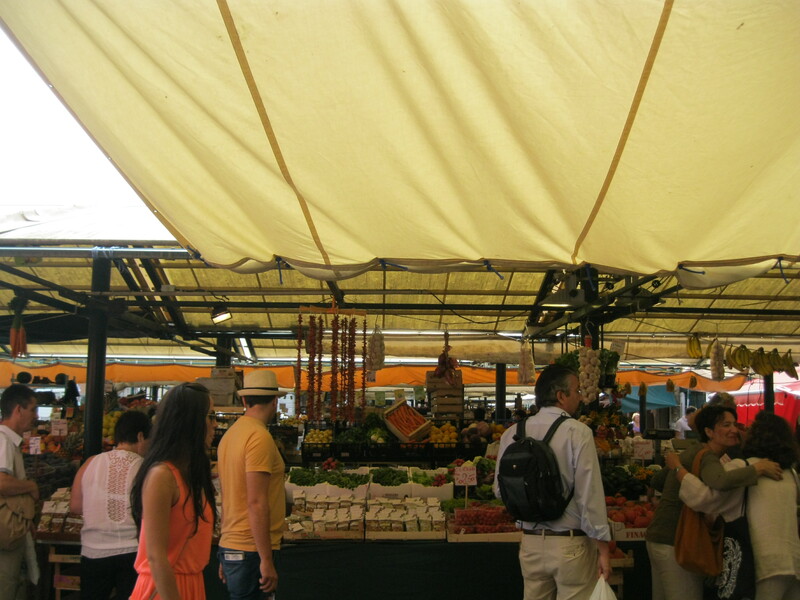 While my nut allergy was far from a problem in Rome, I do have some great food recommendations and stories to share. 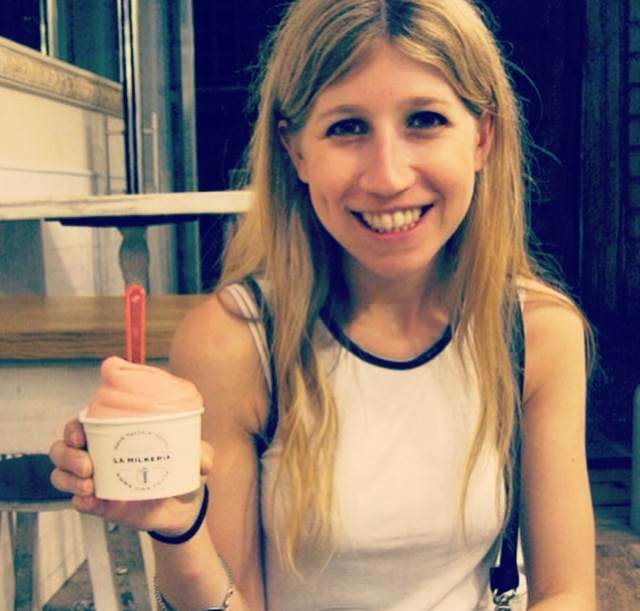 This post will focus on some restaurant recommendations and hot spots, and my next post will share some stories on the dietary requirement / allergy front. So.. firstly, do yourself a favour and eat at Da Gino. We actually had quite a funny experience here. 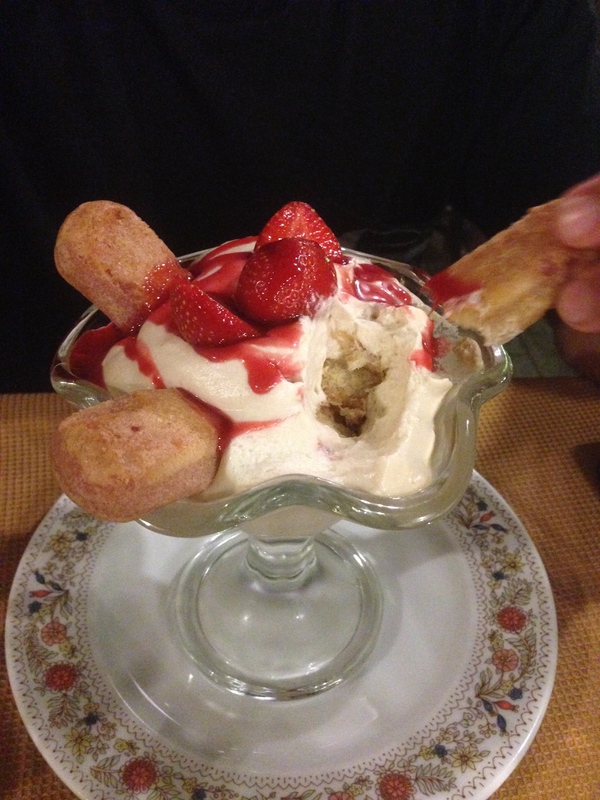 We had read about Da Gino during our research into the best eats in Rome. It is described as a restaurant serving “food like nonna used to make”. It sounded like a winner. We were in the area one night so we decided we would go there. It was about 7.55pm and our stomachs had started grumbling. We (eventually) found the restaurant in the maze of streets and asked to read the menu. After perusing the menu and deciding there were enough options for this fussy Allergian, I turned to the BF and asked if he wanted to eat there, noting that the restaurant was pretty damn empty. We thought we would give it a try anyway. We asked the waiter for a table for 2 and he responded (with a little chuckle) saying they were fully booked. And fully booked they were. In the next 5 minutes or so, the entire restaurant was full. It was amazing. We decided we would book a table for the next night, our last night in Rome, as any restaurant this busy must be worth it. 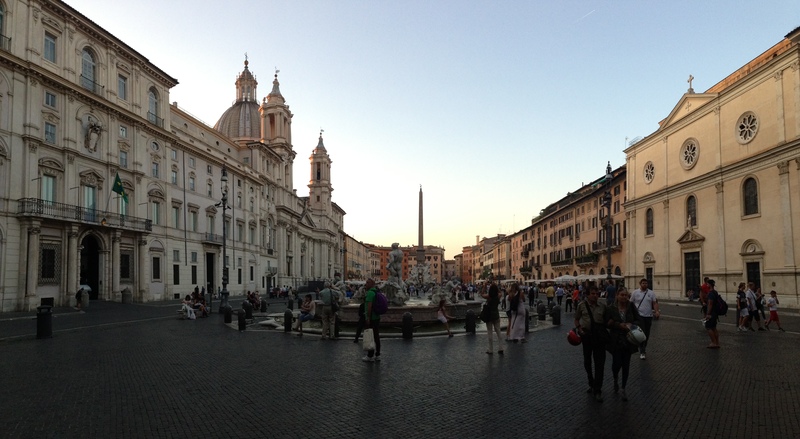 We returned the next night (after almost forgetting about our booking as we were distracted by the entertainers in Piazza Navona) to, again, an overwhelmingly full restaurant and enjoyed a delicious meal. 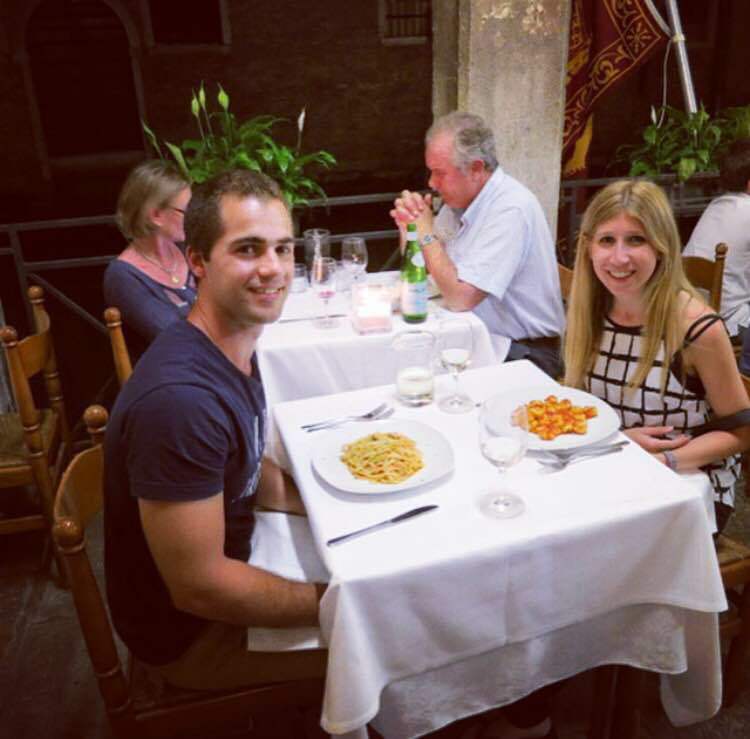 I ordered tagliatelle bolognese and I’m going to put it out there – it was the best bolognese I had in Italy. And that’s saying a lot (I ate a lot of bolognese in Italy)! The next restaurant on my restaurant recommendation tour is L’archetto. This is a famous spaghetti house with over 150 different pasta sauces. There’s just about every type of pasta sauce you can think of, and the spaghetti is served el dente. This is a buzzing, lively place with yummy food! Then we have Ristorante Alessio. I loved this place. It was a few doors down from our hotel and is set in a lovely downstairs courtyard area with friendly staff. I ordered grilled chicken breast and roast potatoes – a bit of a change from all the carb-licious pasta. It was really tasty. From an allergy perspective, this restaurant really impressed me. When I ordered my main meal, I told the waiter about my allergies. After dinner, the waiter came over and started listing all the desserts that I was able to eat and those that I couldn’t eat. The waiter was so on top of my allergies and so helpful that I couldn’t resist. 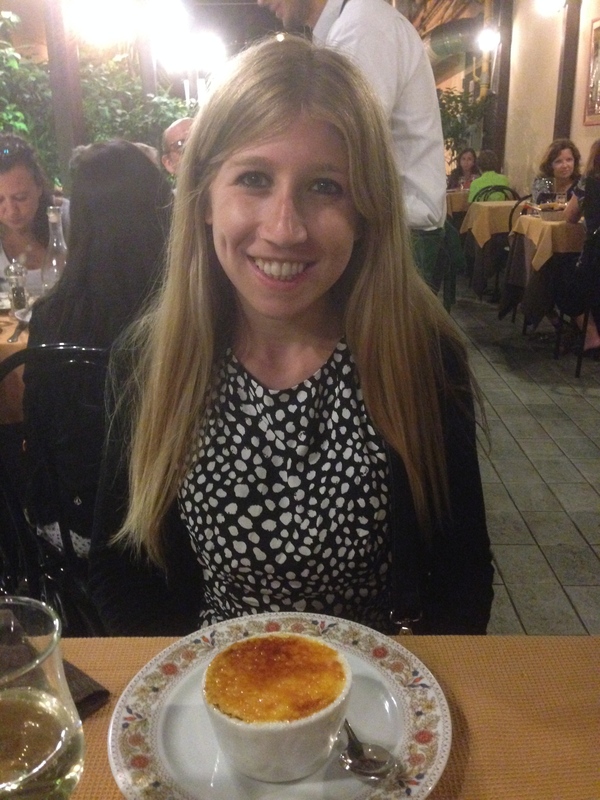 I ordered the crème brûlée, which is generally a safe option, and it was so worth it. Unbelievable. 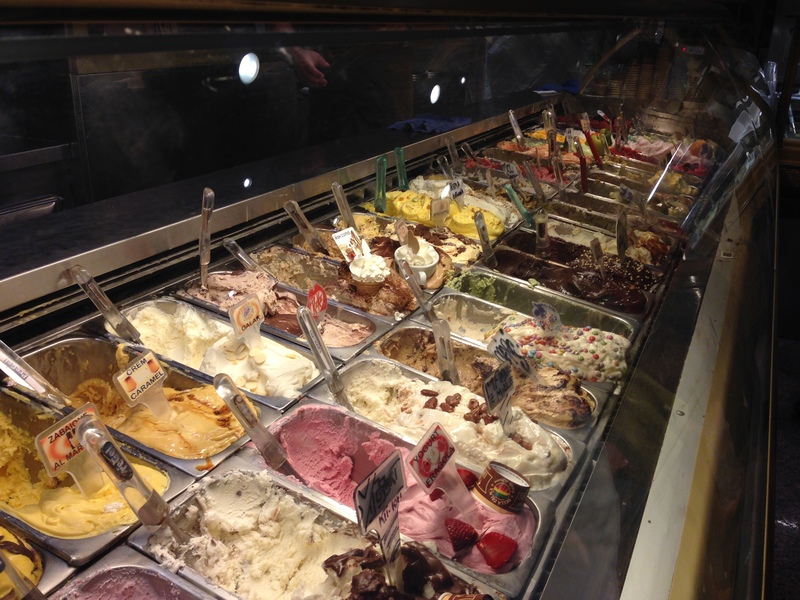 Finally, to finish off with something a bit sweet: Gelateria della Palma is a gelato store with over 100 different gelato flavours. It all looked so drool-worthy, but obviously not suited for this Allergian. I enjoyed it with my eyes and then dragged the BF a few doors down to the safer Lindt option to satisfy my sweet tooth. 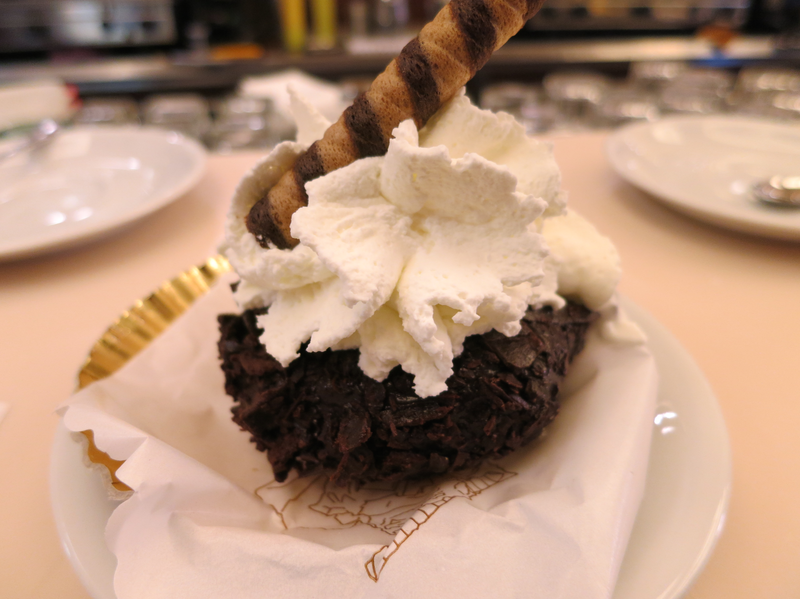 Also, Tre Scalini on Piazza Navona is renowned for its chocolate ice cream truffle (truly – for evidence, see here). I had to pass on this one too, but the BF said it was to die for. Yu-um. Rome continued our streak of delicious food, jam-packed touring, hot summer days and nights, and drinking vino with every meal. Rome was a tough one on our feet. My poor little feet. They just didn’t know what was ahead of them. 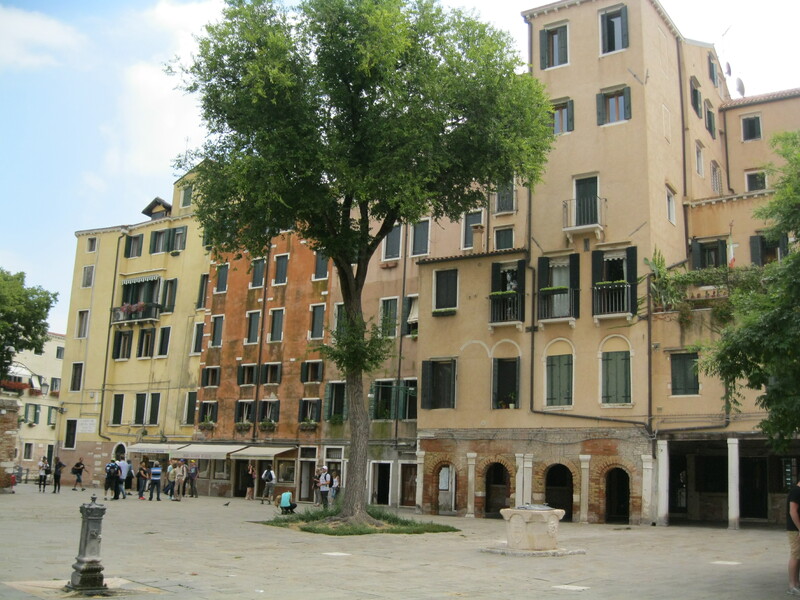 We decided to stay near Termini station at the lovely Al Viminale Hill Inn & Hotel. This was a great location – easy to get to from the station (perfect for lugging the increasingly heavy suitcase, the ever expanding number of carry bags and my consequent impressively enlarging bicep muscles), located along a strip of restaurants and easy to get to anywhere in Rome. 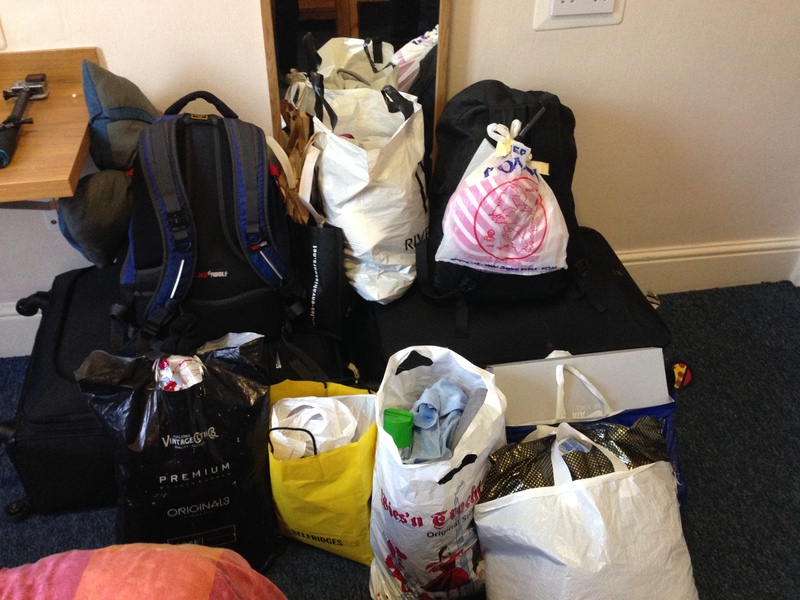 In case you don’t quite believe me, this was our collection of bags by the end of the trip. But.. really, when I say “easy to get to anywhere”, I mean “get those walking shoes on because you’ve got a long trek ahead of you”. No one really warned us, but the public transport in Rome is pretty much non-existent and exceptionally confusing (the one time we took a bus we ended up in the entirely wrong area), so it’s usually easier to walk. But when we looked at a map in Rome, we didn’t quite grasp just how far away things were. It seemed like we could walk to just about anywhere. But what may have seemed like a short walk from the hotel to a tourist site sometimes ended up taking us almost an hour. What this meant was that once we left the hotel in the morning, we were gone for the day. It would take too long to come home in between our day adventures and dinner, so we would end up getting dinner wherever we were out and about and then continuing on into the night. My poor little feet. Despite the pain inflicted upon my feet, I think that walking really is the best way to get to know a city. Getting to know the streets, stumbling upon awesome sights/restaurants/shops, and seeing all the different areas is one of my favourite parts of a holiday. Especially when you stay in a place for long enough to feel like you have “your street” or “your coffee shop” etc. 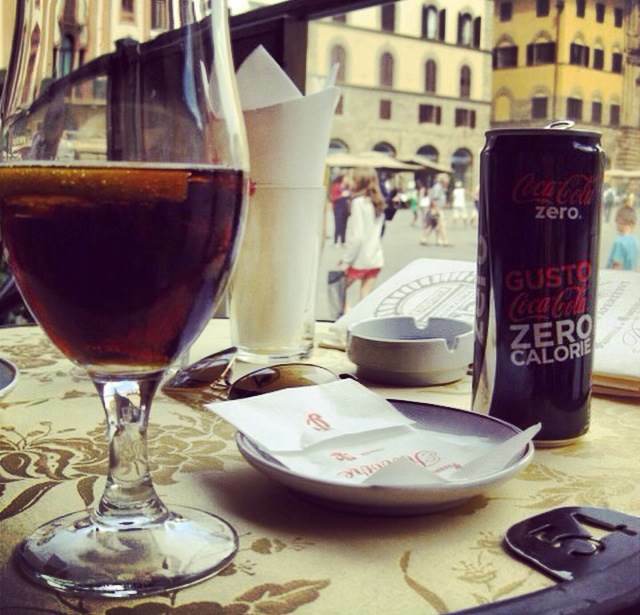 This was something that really resonated with me in Florence. 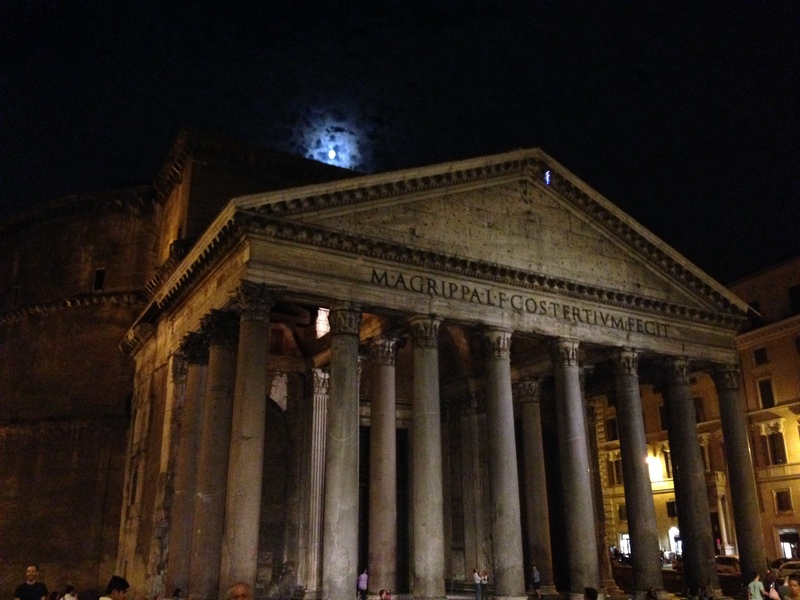 Despite the walking, Rome is such an incredible city. You can be walking through the middle of the city and suddenly stumble upon some ancient ruins. Or some giant building that looks like a wedding cake. 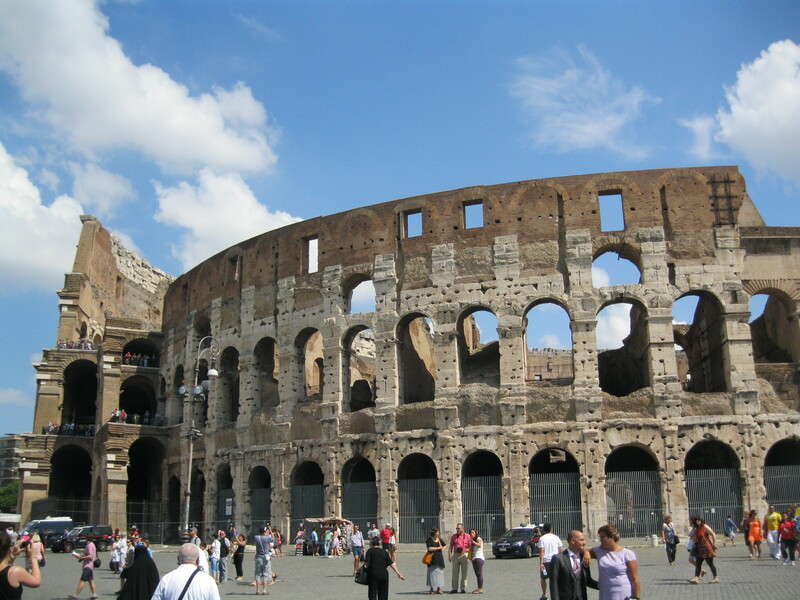 Or a Colosseum! The city just oozes with history and culture that I don’t think is replicated anywhere else in the world. 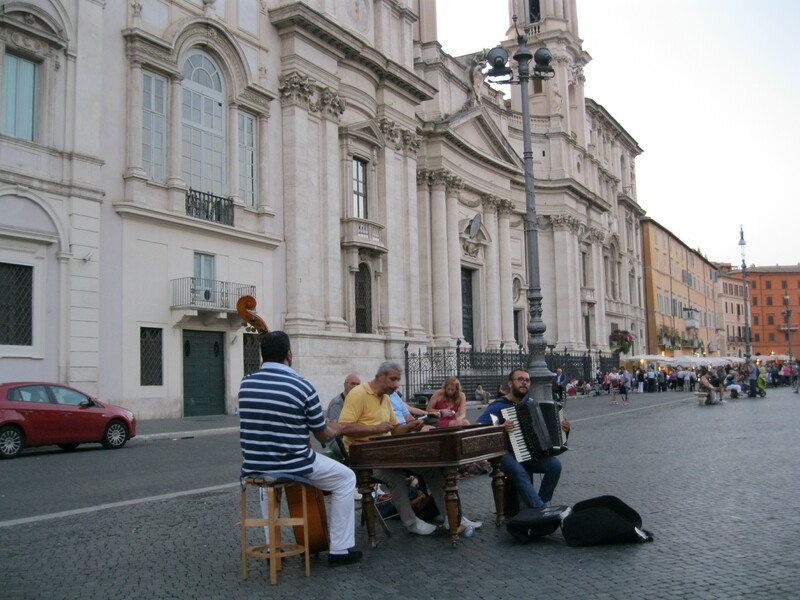 It is also jam packed full of tourist attractions, one of the world’s great museums (Vatican Museum), great food, shopping streets, cafes / gelaterias and talented entertainers (like an awesome group of musicians who play on Piazza Navona). 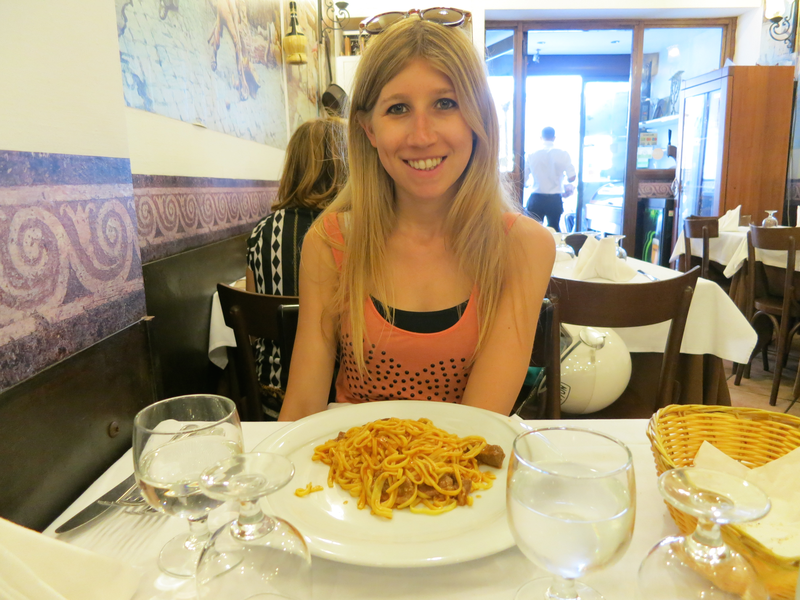 We ate plenty of delicious Italian food in Roma, with my allergies/dietary requirements being pretty easy to deal with. We ate at a few places that had been recommended to us, and some that we stumbled upon during our journeys, but overall had some great meals. 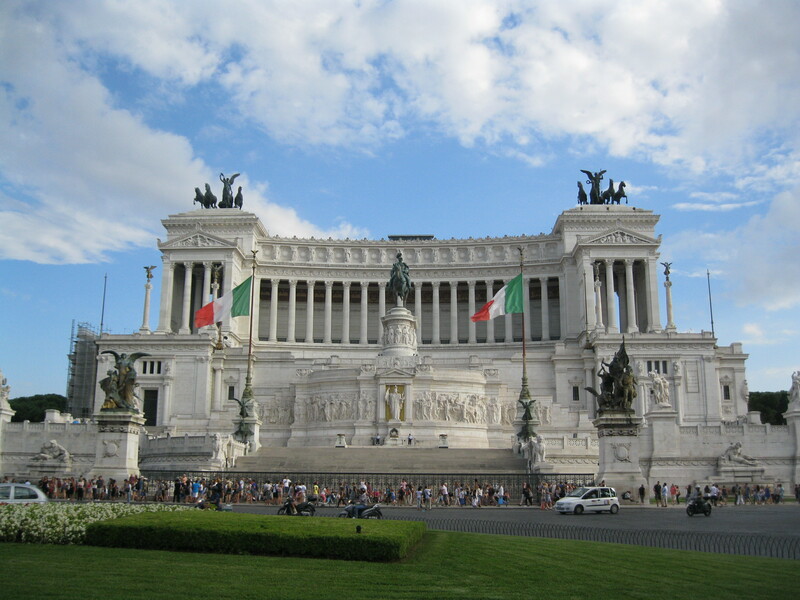 I didn’t have any nut run-ins, but I do have a few stories to share, as well as some great restaurant recommendations, so stay tuned for my next post about beautiful Rome! 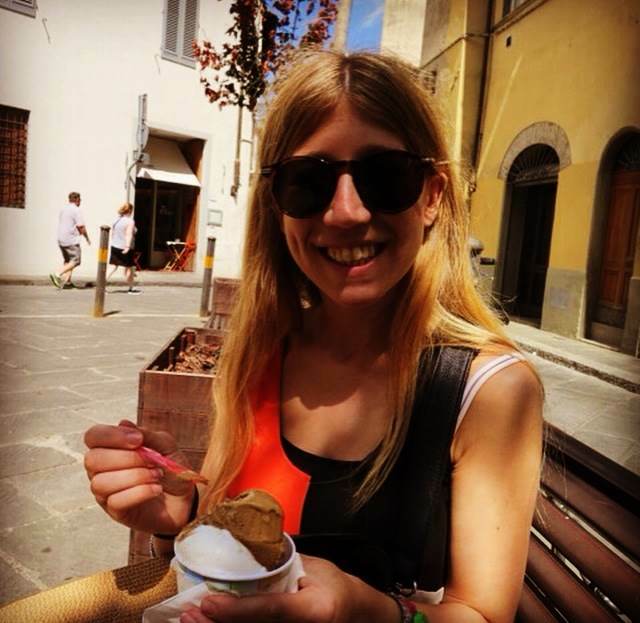 In my previous post, I shared my advice about what to do in Sorrento and surrounding areas – the must-dos and must-sees. Given this is a food blog, I should probably talk about food. 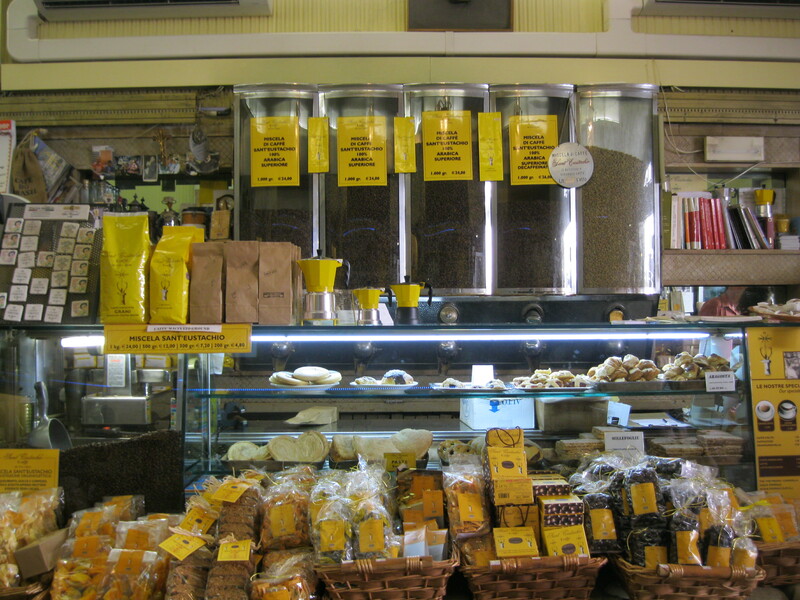 I have just a few words to say about nuts and food in Sorrento. 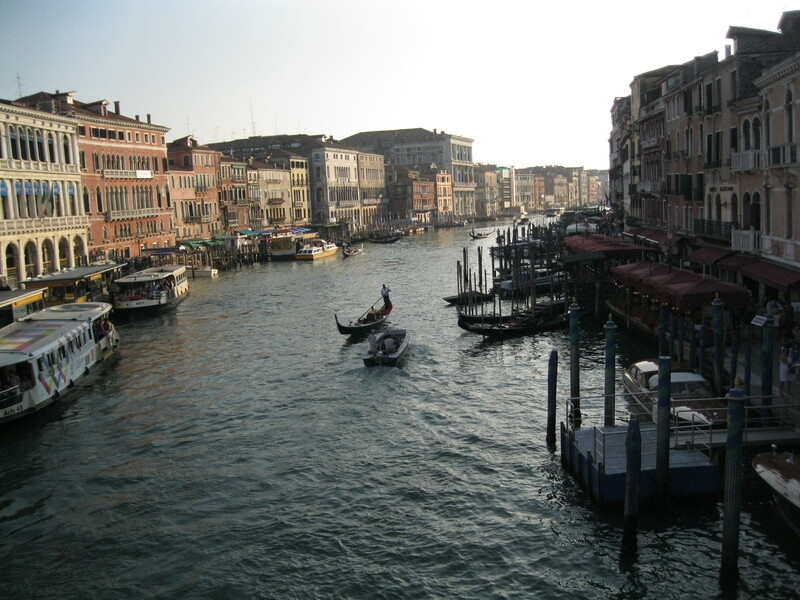 Generally it was quite uneventful, given Italian food is pretty easy for me. Firstly, please note that in Sorrento almost all the restaurants/bars give peanuts on each table when drinks are ordered. This is just a standard snack over there, so walking down the main strip of restaurants looking for a place to eat was a bit worrying. I didn’t really want to eat at a place that had peanuts served all around the place. Sitting at a bar with other people eating peanuts around you is one thing, but eating there is a whole other story. But don’t worry too much – you will be able to find some places that have no peanuts served. 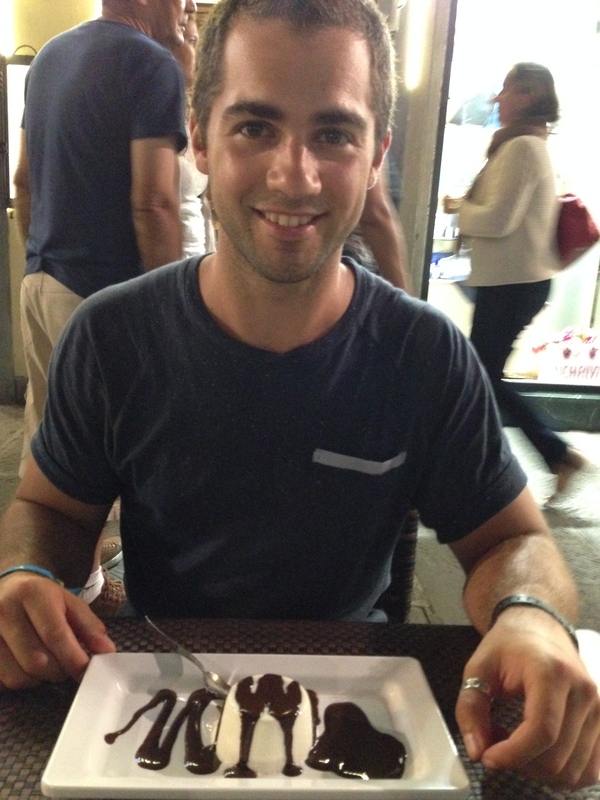 I ate at a great restaurant, Song’e Napule (on Corso Italia – the main road) which didn’t serve peanuts. The BF and I shared a delicious gnocci and veal escalope there. On the one night, after rejecting most places due to the peanut snacks, we decided on a restaurant called Syrenuse Bar Ristorante. It appeared from the outside that most people were eating rather than drinking, but I did spot a few tables with peanuts. I asked the waiters if they wouldn’t mind changing the tablecloth and cutlery for me, just to be extra careful. It was a fancy-ish restaurant compared to most of the others. I chose to order the veal escalope with a side of roast potatoes. I asked the waiter about peanuts, who advised me that they ordinarily fry the veal escalope in peanut oil (and similarly for lots of their cooking), but said he would ensure they use a different oil for me. He could see I was nervous, but he reassured me that they would be careful. I said OK, but then as soon as he had walked away, got a bit worried that maybe this wasn’t good enough. So we called him over again with the intention of leaving to go back to Song’e Napule. He said that was fine, but again reassured me that they would be really careful, and would cook it in the oven with no oil, instead of frying it. In seeing how seriously he was taking it, I decided it would be fine and agreed to eat there. When my food came out, he again reassured me AND even went one step further. He brought me out some anti-histamines. It was hilarious. I told him that anti-histamines wouldn’t really help, as my reaction could be much too serious for anti-histamines. He understood, but thought it will still better that I had them there (they were really strong anti-histamines) than didn’t have anything. It was very nice of him, and pretty funny! He also told me to be careful because lots of the restaurants in Sorrento cook with peanut oil. Eating was fine in Pompeii and Capri. In Capri, we found a place in the main area where we had some (pretty average) gnocci. 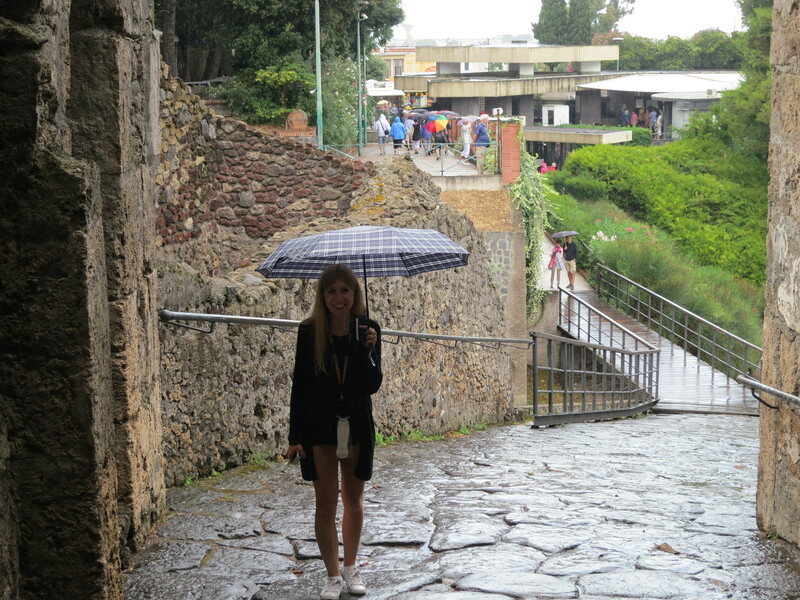 When we visited Pompeii, we had lunch just outside the entrance. There isn’t much in the area except for about 3 restaurants in a row. 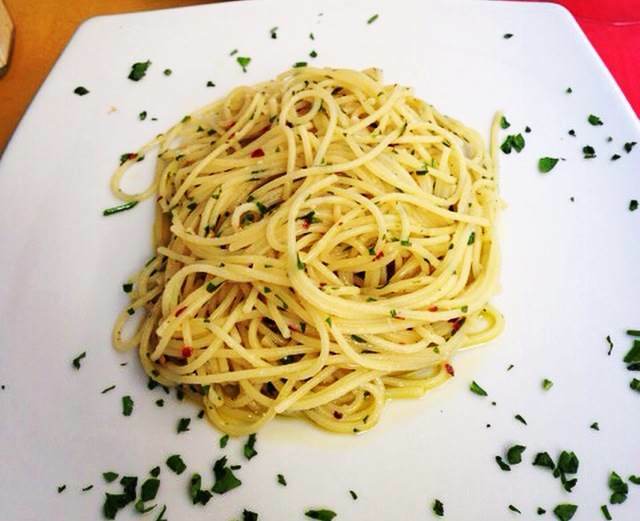 I had spaghetti aglio e olio and it was very yum! 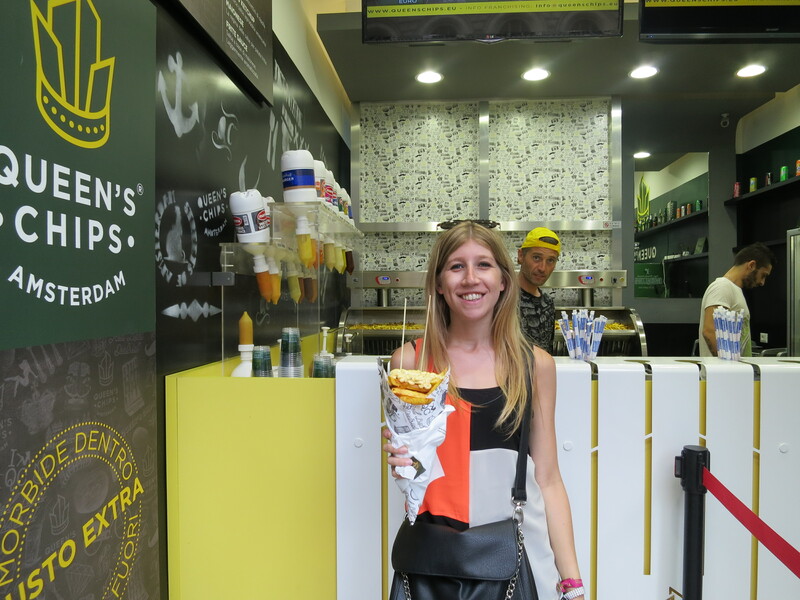 If you are ever stuck for food, there is always the safe option of Queen’s Chips Amsterdam where you can order a massive cone of hot chips with the sauce of your choice. 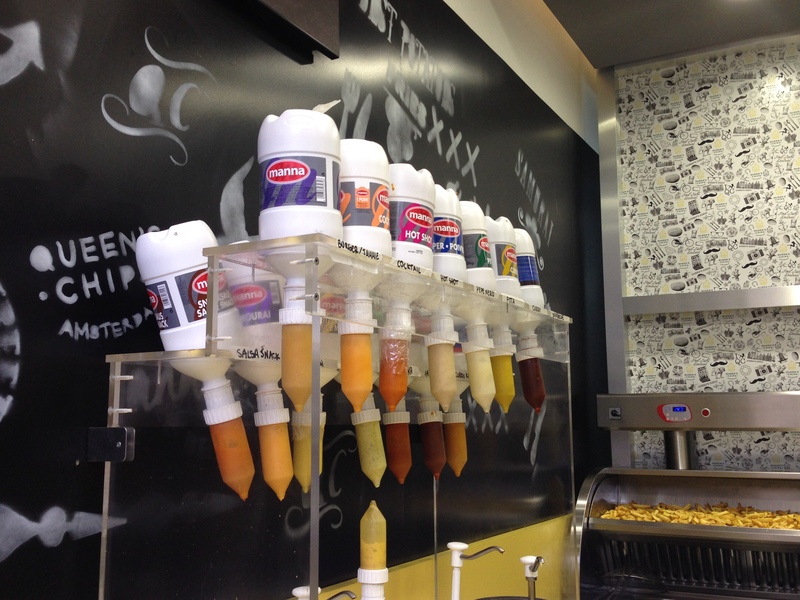 And there are no nuts in any of the sauces! Win!! They are delicious, especially with the sauce drizzling everywhere. YU-UM! And that’s about it for my time in Sorrento. It was short and quick, but definitely worth the visit! 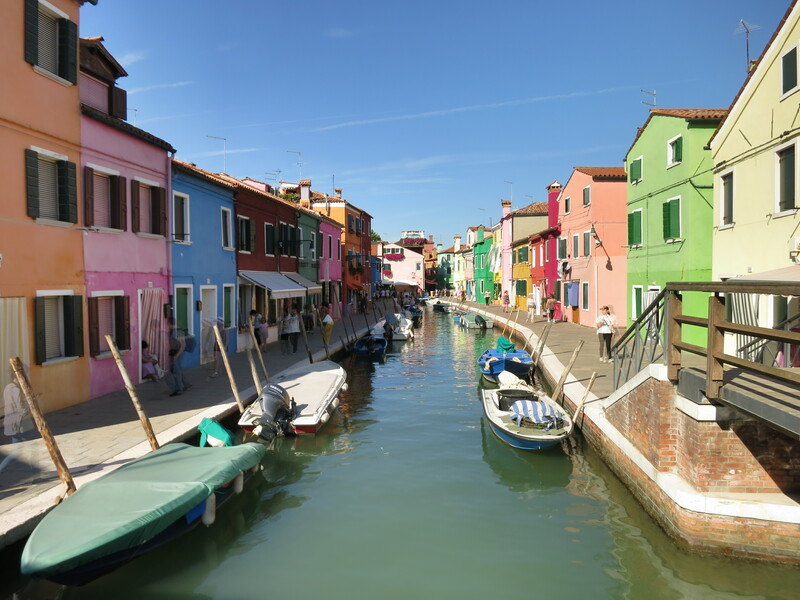 After 5 nights, we were very sad to be leaving beautiful Venice, but at least we were moving on to Sorrento in the South of Italy. After a torturous journey – a vaporetto, a train to Florence, a train to Naples and then an incredibly frightening train to Sorrento – we arrived in buzzing Sorrento. We didn’t have exceedingly high expectations of Sorrento, expecting it to be a small quiet place. But just like our lucky timing in San Sebastian, we had arrived in Sorrento smack bang in the middle of their holiday period – when all the Italians (like those who had been absent from Florence) were vacationing in Sorrento (and the surrounding areas), so we had finally caught up to them. This meant that Sorrento had a real buzz to it, with a local-tourist type feel. It really had an awesome vibe. Walking down the main street at night – the restaurant terraces were packed, the shops were open late, the street performers were all on show. Despite the fact that we had been travelling for the last month, arriving in Sorrento felt like we had just begun our vacation. I guess walking >25km a day (like we had been doing thus far) isn’t exactly relaxing. Arriving in Sorrento was a breath of fresh air. Perhaps it was the sea air. Aside from the thrilling buzz of the place, we also had some really great Italian food here. I really didn’t enjoy their famed limoncello though. But then again, that really applies to all limoncello [and Grappa (which I tried in Ios), Campari (which I tried in Venice) and Ouzo (which I tried in Mykonos) – basically, if it doesn’t say Bailey’s, then liqueur just isn’t for me 😉 ]. I wouldn’t say the food is quite as good as Florence, which I think is unbeatable, but it was definitely enjoyable and there is plenty of variety along the main strip. 1. Go on a boat tour around the island for some interesting scenery and sights. They usually go for an hour or two, and show you some great things. 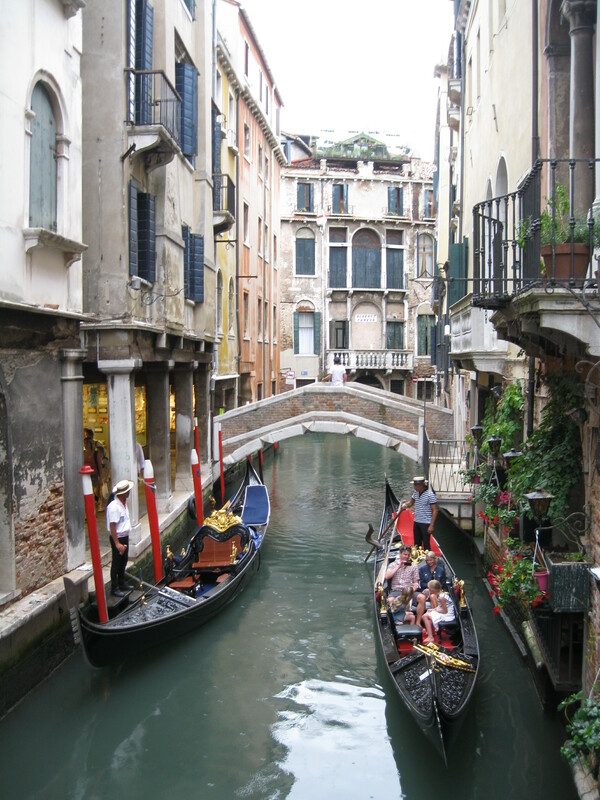 They aren’t particularly expensive and will take you to the blue grotto which is a must do – see (2) below. 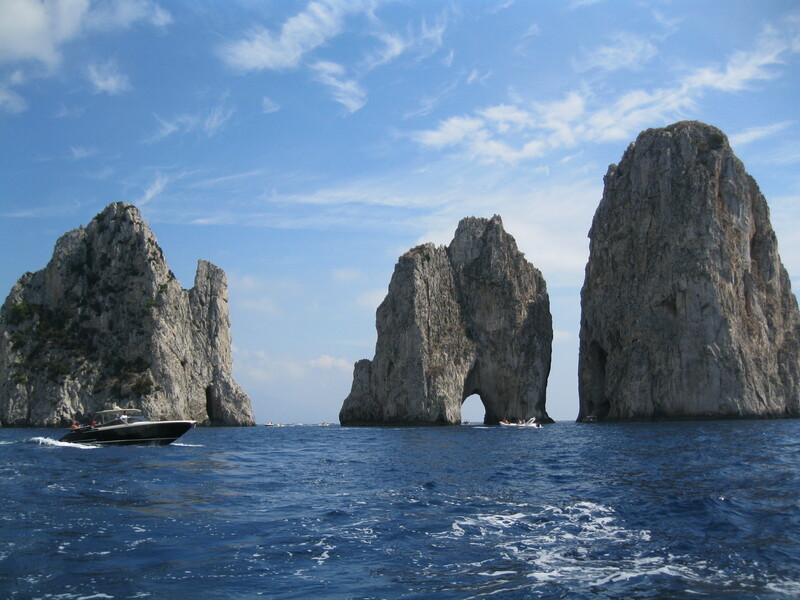 I would recommend going straight to the blue grotto upon arriving at the Isle of Capri, as you often cannot visit during the afternoon due to high tide. And you DON’T want to miss out, trust me!! 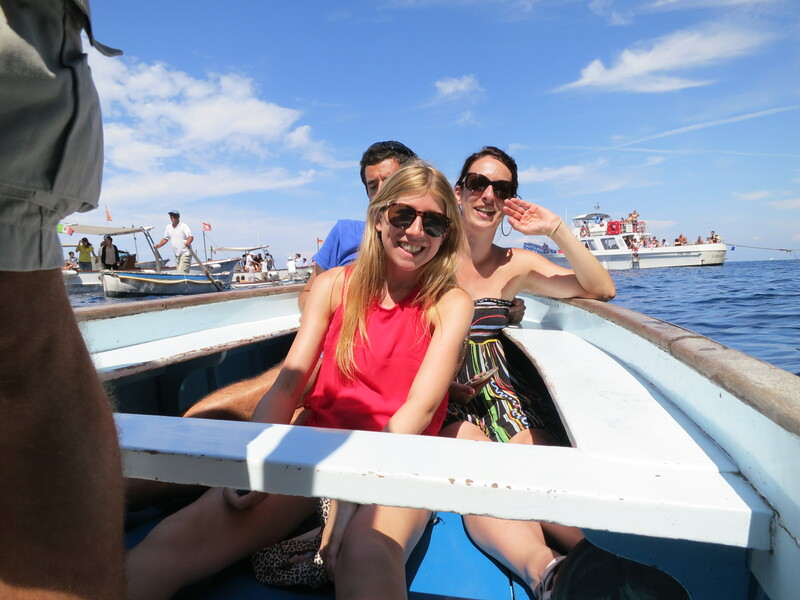 There are often really long queues to enter the blue grotto – it is DEFINITELY worth the wait. On our boat tour, the BF and I were the only ones who wanted to wait in the queue, so the tour guide dropped us onto another boat to wait. 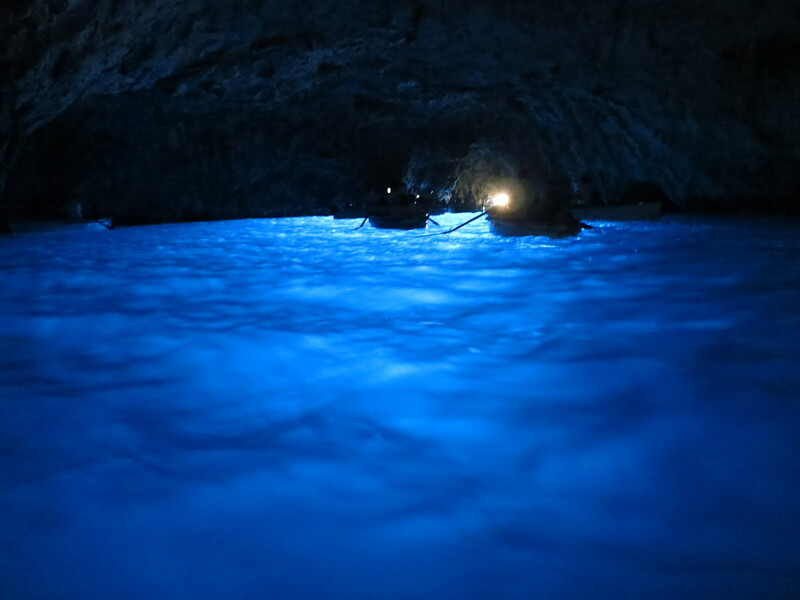 GO INSIDE THE BLUE GROTTO – I cannot stress this enough. The 40-minute wait was well worth it. You get onto a mini row boat which takes you inside a cave through a very low entrance (you have to lie back in the boat in order to enter). Inside, you have the most incredibly blue, clear water and the way the light enters the cave creates an amazing colour; the boat riders sing, which creates a wonderful echo inside the cave. The photos don’t even do it justice. 3. 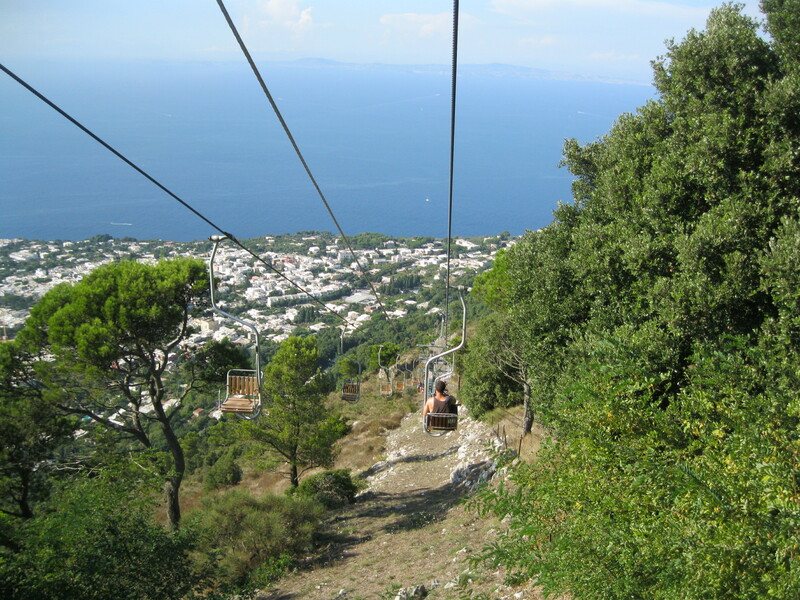 Go on the chairlift to the top of Mount Solaro (which is 589 metres above sea level) for unbelievable views. The chairlift itself takes 10/15 minutes each way, and also has the most splendid views. The feeling of your legs dangling on top of the world is incredible. 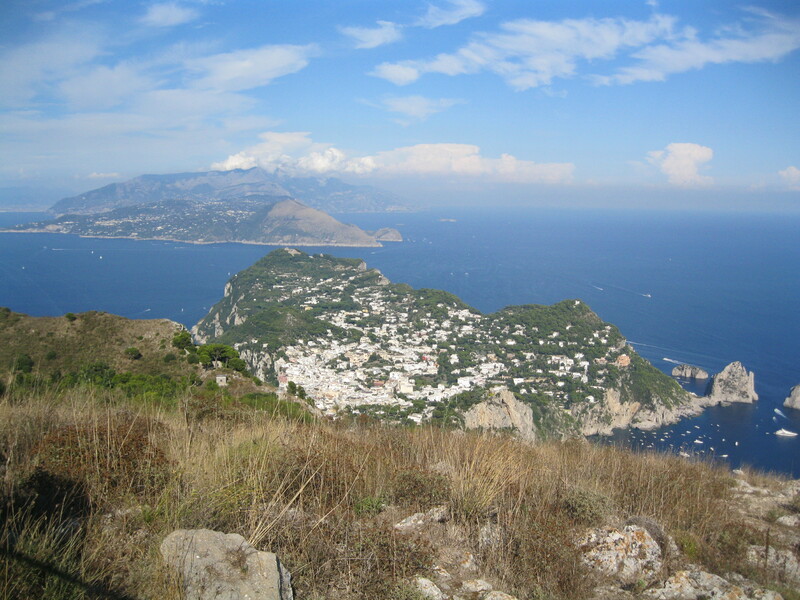 Unfortunately we didn’t have time to also visit the beautiful Positano or Amalfi Coast while we were in Southern Italy. We were even willing to brave the (apparently) intensely scary bus drive to get there, but we just couldn’t squeeze it in. I guess this is just an excuse to go back some day! 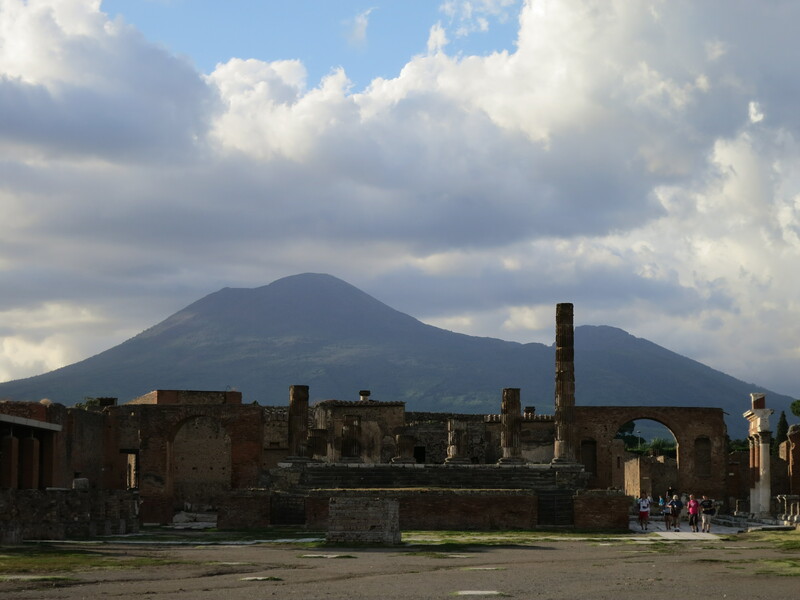 We also visited Pompeii, which was a moving experience. But the audio guide was hopeless. It didn’t even direct us to the right sites, which is worse than walking around on your own unguided. It made me very angry. Warning: we got caught in a summer storm (we thought maybe there was going to be another volcanic eruption). Luckily there were heaps of vendors selling umbrellas and ponchos just outside the entrance. It definitely set the right mood for a place like Pompeii, though. More to come on the topic of beautiful Sorrento and a few nut run-ins! Until next time… buona giornata.